Fabulous 698B is holding a series of supper clubs at the Thrown Gallery in Highgate on Saturday 21st July, and Friday 3rd and Saturday 4th August. The £60 6 course dinner will be served on ceramics specially made for the event, with pieces available to buy on the night. 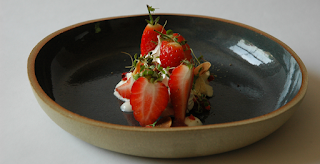 "A collaboration between pop-up restaurant fabulous 698b and specialist ceramics gallery thrown brings a unique supper club experience to Highgate this summer. Corresponding with an exhibition in the gallery celebrating tableware, the dinner will take place within the exhibition space with six creatively crafted courses. Join them at the table for a £60 6-course menu plus complimentary cocktail, plated up on their work especially made for the event. The experience will start at 7 pm with an introduction of the exhibition followed by the fabulous dinner. There will a selection of wines available for purchase at the bar. Should you wish to take any of the original ceramics involved home, there will also be the opportunity to purchase the pieces at an exclusive price."